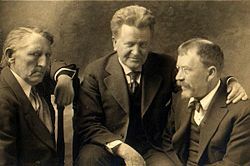 Lincoln Steffens with Senator La Follette (center), with maritime labor leader Andrew Furuseth (left), circa 1915. Joseph Lincoln Steffens (April 6, 1866 – August 9, 1936) was an American journalist and one of the most famous and influential practitioners of the journalistic style called muckraking. He is also known for his 1921 statement, upon his return from the Soviet Union: "I have been over into the future, and it works." His more famous quote "I've seen the future, and it works" can be found on the titlepage of his wife's, Ella Winter, 1933 edition of Red Virtue. His journalism courted controversy but also represents the "fourth estate" at its best. Politicians are of course bound by the same laws as the rest of the population but their office sometimes makes it possible for an unscrupulous individual to by-pass legal constraints, or to ignore them and unless their actions are made public, no action can be taken to censure them. In free societies, this role tends to fall within the remit of the press, which, although a non-official, commercial—not a civil society—enterprise, regards itself as serving the public interest. This is why the press is sometimes referred to as the fourth branch of government (or as the fourth estate), alongside the executive, legislative and judicial branches. Steffens annoyed many of the people about whom he wrote but he had a gift and a passion for investigating corruption, poverty and human failings and a penetrating interest in their causes, in the depths of human experience. His muckraking was a socially responsible enterprise, somewhat different from the type of sensationalist journalism that intrudes into the personal lives of celebrities to expose behavior which, however immoral, ought to remain as private as the conduct of non-elite people does in whom the press rarely shows an interest. Steffens wanted all people to enjoy a reasonable standard of life in freedom and with dignity and was deeply and genuinely concerned with issues of social justice and human rights. Steffens was born in San Francisco, California, the son of Joseph Steffens, a wealthy businessman, and his wife, Elizabeth Louisa Symes. His parents went on to have three girls after his birth. He grew up in Sacramento. After attending a military Academy, he studied at University of California, Berkeley, where he was first exposed to radical political views. It was while at Berkeley that he concluded that an understanding of philosophy was vital in order to fathom how society works or addresses the great questions of life and meaning and purpose, and it was this interest that took him to Europe where he studied psychology with Wilhelm Wundt in Leipzig and with Jean-Martin Charcot in Paris. Returning to the United States in 1892, he started his journalism career working for the New York Evening Post, reporting on the police. His father gave him $100 and said that his days of study were over and now he should fend for himself. He soon began to investigate corruption as he discovered a complex web involving the police, elected and appointed officials. On November 4, 1891, he married Josephine Bontecou, whom he met in Germany. His work on police corruption in New York helped to defeat what was known as the Tammany machine's candidate for election as mayor in New York in 1894, and to elect William Strong instead, a reformist candidate. He later set up a board of police commissioners, headed by future President Theodore Roosevelt. At McClure's magazine, Steffens became part of the celebrated muckraking trio of himself, Ida Tarbell, and Ray Stannard Baker. He specialized in investigating government and political corruption, and two collections of his articles were published as The Shame of the Cities (1904) and The Struggle for Self-Government (1906), he also wrote The Traitor State, which criticized New Jersey for patronizing incorporation. In 1906, he left McClure's, along with Tarbell and Baker, to form American Magazine. In The Shame of the Cities, Steffens sought to bring about political reform in urban America by appealing to the emotions of Americans. He tried to make them feel very outraged and "shamed" by showing examples of corrupt governments throughout urban America. Steffens was convinced that the role played in American politics by big business actually perverted the process and integrity of representative government. In 1910 he covered the Mexican Revolution and began to see revolution as preferable to reform. His wife, Josephine, died January 7, 1911. It was not until 1919 that he visited the Soviet Union together with William C. Bullitt and the Swedish Communist Karl Kilbom, and developed a short-lived enthusiasm for communism that had soured by the time he wrote his memoirs, published in 1931. He was a member of a group that came to be known as the California Writers Project, funded by the New Deal. Some of its members were socialists or communists, while others had little formal interest in politics. Steffens did have an interest in communism following his visit to the Soviet Union and thought that America would benefit from a revolution, hence his famous comments. He believed that unrestricted capitalism did not work well for all people because wealth can be accumulated at the expense of others, who then become victims of uncontrolled exploitation. He became popular as a lecturer, using his sense of irony rather than indignation to provoke his audience to question the power of corporate America within the nation's politics. He was critical of the popular assumption that economic success was in and of itself proof of anyone's moral worth. He tended to pose questions to provoke thought, rather than to propose answers so much so that it was not actually what he said, or wrote, but how he said or wrote with "wit, charm and compassion" that won his hearers and readers' hearts. He married his second wife, Ella Winter, in August 1924. Steffens became increasingly unhappy with life in America, where the "American Dream" seemed to him to be restricted to some people, and in 1917 he moved to Italy, where he lived until 1927 making an extensive study of radical political movements in Europe. His Autobiography (1931) made him once again a popular speaker on the lecture circuit, and he regained some of the popularity he had lost in 1920s due to his radicalism, and possibly also because of his Communist sympathies. He died in 1936 in Carmel, California. Steffens is remembered as the most independent reporter of his age. He was willing to go out on a limb and challenge the federal government, exposing its secrets to the public as he advocated for change. He had a major impact on the public he wrote for and the way that they viewed their representatives. He was a charismatic individual who promoted radicalism at the local level. Steffens dedicated his life and his work to shaking things up and attempting to bring about great change. ↑ Winter, Ella. Red Virtue: Human Relationships in the New Russia (London: Victor Gollancz LTD., 1933). ↑ Kaplan, Justin. Lincoln Steffens: A Biography (New York: Simon & Schuster, 1974 ISBN 9780671215927), 15. ↑ Kaplan, 26-32, 34-43, 47-49. ↑ 7.0 7.1 Kaplan, 329. ↑ Steffens, Lincoln. Encyclopedia of World biography Steffens, Lincoln Retrieved December 26, 2007. Schultz, Stanley K. "The Morality of Politics: The Muckrakers' Vision of Democracy." The Journal of American History 52, no. 3 (December 1965): 527-547. JSTOR Retrieved December 26, 2007. Steffens, Lincoln. 1889-1919. Vol. 1, The Letters of Lincoln Steffens. Edited by Ella Winter and Granville Hicks. New York: Harcourt, Brace, and Co., 1938. Steffens, Lincoln. 1920-1936. Vol. 2, The Letters of Lincoln Steffens. Edited by Ella Winter and Granville Hicks. New York: Harcourt, Brace, and Co., 1938. Winter, Ella. Red Virtue: Human Relationships in the New Russia. London: Victor Gollancz LTD., 1933. This page was last modified on 23 July 2018, at 15:28.